A little over a week after its introduction to the public here in Jerusalem, the Temple “purity” seal has been reinterpreted, complete with a new reading of the inscription. If you missed the previous hoopla, see my previous post on this topic, which includes links to other resources on the story. Today’s Haaretz carries the story of the new ‘take’ on this intriguing object. (The story is found on-line HERE. The complete text appears below.) Although the headline reads “scholars” — plural — it is apparently just one scholar, Prof. Shlomo Naeh of the Hebrew University’s Talmud department. He believes the characters on the face of the token could be abbreviations for the Aramaic word for “ram”, the word aleph for the first day of the week, and Yehoyariv, the priestly order that served on that day. Naeh, like Reich and Shukron, supports his theory with a Mishnaic reference, which is not cited in the story, however. So, he believes the object represents an offering or, more specifically, a sacrifice, purchased in the Temple courts. It is clear by now, too, that this is not a “seal” in any traditional sense — it did not seal a container or other object — but it is really a token certifying that payment had been made. Just to aid my understanding, I asked one of our scholars here at the Ecole Biblique, who had also read the story, if the worshipper, after paying the required amount, would then exchange such a token for an actual animal, which he would then take to yet another priest in order to carry out the sacrifice. OR, did the transaction with the token fulfill the worshipper’s obligation, with the rest of the sacrificial process conducted out of his sight. The scholarly response I received (not surprisingly) was that it was not at all clear, and the subject of much debate. It bears noting that the Mishnaic verses cited in the official announcement released by the IAA do seem to indicate that the worshipper, at least for some sorts of offerings, was obtaining the actual offering, which he would then present in person. Perhaps it goes without saying that the Temple, as an institution, must have had a very involved protocol covering the many different kinds of offerings and sacrifices designated for different occasions and situations. This newly discovered object provides, at best, a tiny window into that world. Object, at the northwestern [sic; it’s SOUTHwestern! -tp] corner of the Temple Mount, was initially thought to read ‘Daka LeYa,’ which means ‘pure to God’ in Aramaic. A new interpretation is being put forward for the inscription on a tiny clay object, only a week after it was touted as the first archaeological find to confirm written testimony of ritual practices at Jerusalem’s Temple. The object, discovered in an archaeological survey at the northwestern [sic; SOUTHwestern] corner of the Temple Mount, was initially thought to read “Daka LeYa,” which means “pure to God” in Aramaic. 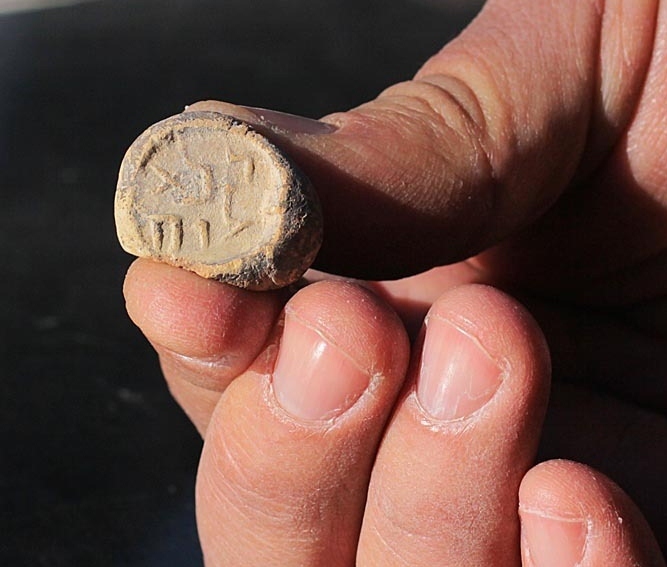 Excavators Prof. Ronny Reich of the University of Haifa and Dr. Eli Shukron of the Israel Antiquities Authority told a press conference last week that this was a seal used to mark objects used in the Temple as ritually pure, and that such a seal is mentioned in the Mishna. But Prof. Shlomo Naeh of the Hebrew University’s Talmud department believes the inscription could be read differently. “I was sitting with my son and looking at the photograph, and in a moment of intuition, I realized what it could be,” he told Haaretz Tuesday. Naeh also believes the object is related to Temple worship and purity, but reads the inscription differently, as “Dakar a Leyehoyariv.” Dakar in Aramaic means ram and a stands for aleph, the first day of the week, when the priestly order of Yehoyariv was on duty in the Temple. Thus, the object was used in Temple worship, but not how Reich and Shukron believe it was, says Naeh. To ensure the purity of animal sacrifices offered in the Temple – and to maintain an economic monoply, Naeh believes – pilgrims had to buy their offerings in the Temple courts. They gave money to a treasurer who would exchange it for a token inscribed with the type of sacrifice they had purchased and the date. He also said the object could not be a seal because it lacked a hole for a thread or a handle to affix it to another object. “People have been saying the ancient sages fantasized everything about the Temple. But … they knew what they were talking about. For me, this is uplifting. The sages of the Mishna, my guys, win out,” Naeh said. This entry was posted in Archaeology, Haram/ Temple Mount, JERUSALEM, Temple and tagged Archaeology, Jerusalem, Mishnah, Offerings & Sacrifices, Second Temple, Shlomo Naeh, Temple Mount, Temple token. Bookmark the permalink.